Been a little slack on updates lately—things have been a little nuts approaching the holidays! We’re coming down to the business end of the season now, and many of the remaining weekends have only a single race. Makes it a little tough to maintain the high end fitness, but does give a bit more time for maintenance! This course is largely grass, with a long staircase that is broken up into two sections and just a little bit of ‘native’ grass and dirt. A snowstorm in the days beforehand didn’t pan out as deep as we had hoped, and the course had only a couple inches on it come race day. Carl was still on the shelf with his concussion, so it was left to our Women’s squad to carry the flag for us this day! Since this race was part of the main series, and the only event this weekend, the fields were large, as expected. Kristal went first in the SW Open, with all the usual (fast) suspects. She got a great jump at the start, but then got caught by the field’s surge, leaving the pavement in about 9th. But, with her improving form, she was able to steadily move forward throughout the race. She rode solid and aggressive the entire time, eventually finishing 4th on the day, just 3 seconds off the podium. Errin went next, with her debut ride in the SW3 category! Ordinarily, this would have been a total power course with all the grass, but the wet snow reduced her advantage there and made it a lot more technique dependent (along with needing the ability to run lots of stairs!). That, combined with upgrading, made Errin’s 11th place result a great performance! Kristal and I love this race. It has a really relaxed, throw back vibe, and provides a great way to get in some morning intensity before spending most the rest of the day eating! They run just three races—Men’s and Women’s A, B, & C, with Juniors all combined together with the C fields. It is held at Bear Creek Lake State Park in Lakewood, with a primarily singletrack course through woods, stables, and a sandpit, and has two large climbs—one paved, the other rocky dirt. This was also Carl’s first race back, so he was psyched! Last year’s Turkey CX was my first ever podium, so despite two weeks off from racing, I was hoping for a good result. I lined up front row in a fairly strong field of 43 guys for the Men’s B race. I got a good start, heading into the singletrack in 4th place. After spending half a lap recovering from the start, I was in 5th place and began moving forward. The race was really fun, since I was in a group of about 6 guys racing for 3rd place (1st and 2nd were gone). I was generally at the front, but any bobble resulted in my getting passed and then having to dig deep to regain my spot. Finally, I was able to put in a big effort on the last lap to get some space and rolled in safely on the final podium step! Kristal decided that since this race held no series points, it would be a great opportunity to race her singlespeed in advance of Nationals. She entered the Women’s A race with a dozen women. 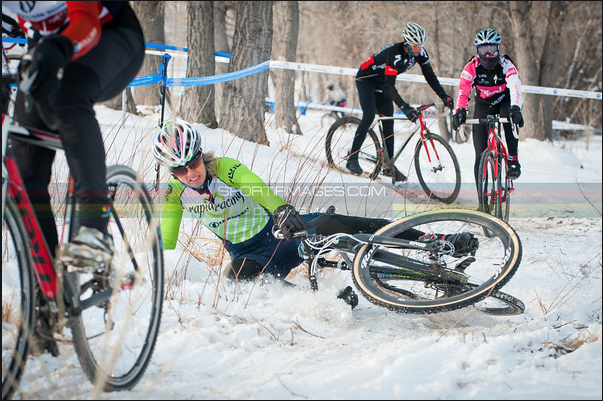 She was clearly outgeared on the start climb and left the pavement in about 5th place. By the time she got back to the pits, however, she had ridden into 2nd place. She would maintain that position for the rest of the race, finishing about 30 seconds behind local pro Rebecca Gross, and about 3 minutes ahead of 3rd. It was a great result, especially on a SSCX! This race was held at the same churchside venue as the Zero Gravel race earlier this season. It had twisty, loose turns with some short steep climbs. It also had a manmade ‘rhythm’ section comprised of 2 sets of 2 steep bumps set really close together. It was hard to carry any speed through that section! This was also one of our few races this year with 100% team participation--given busy schedules, etc., it’s always fun when we can get all 5 of us to a race together! Errin led us out, with a solid ride to 9th place in the SW3’s. Not bad—only her second race in the 3’s and already into the top 10! Carl and Rob went next in the SM 45+ race. It had nearly 50 riders and, being the only race of the weekend, everyone was motivated. Carl got an okay start and made his way forward until the last 2 laps when the time off caught up to him and he slid back a bit, losing 2-3 spots to end up in 24th place. Rob adopted the opposite strategy, starting towards the back, but steadily picking guys off to roll in 36th. Couldn't have asked for a better day to race, especially for the end of November. 60 degrees and sunny, and a good way to start working off Thanksgiving dinner! This ended up being the smallest field I've ever raced in (21 at the start); combine that with the 10-wide grid, and I had my best call up since early in the season. I had a good start, moving off the pavement and onto the dirt in fifth or sixth place. I felt great, holding my spot for about the first half of the lap. Unfortunately I made one mistake in the first technical section, a series of 180 degree turns on some loose terrain, and I went down. The guy behind me got tangled up in my wreck, and I lost several spots, probably losing 8 or 9 places while I got sorted out. I was able to battle back for a few of those places by the end of the second lap, but the lead group was no longer in sight. I ended up fighting back and forth with same guy for three laps, and finally dropped him late on the last lap to finish 12th. Not bad, but a little disappointing given how good my legs felt. If I hadn't gone down on the first lap, I'm confident I could have grabbed my first top 10. Finally, Kristal hit out, with a smallish field. She was struggling with motivation this day and a little off the pace, finishing in 5th place overall. Finally, some weather! The same arctic air mass that is covering most the country moved into Colorado on Tuesday, bringing occasional snow and single digit high temps. Race day dawned with temps below zero and about 6” of snow on the ground. We were psyched to get a chance to test our clothing systems in case of harsh conditions at Nats, and also to ride on something other than loose dirt! The course was super fun, with twists and turns and extended sand sections that would have been challenging, but instead were frozen. Riding at speed required confidence drifting turns and the benefit of power on the straightaways was neutralized by ice. Kristal and Carl’s races were back to back, so that allowed them to ride some preview laps together, but then left Carl finishing his warmup in the pits on a trainer during Kristal’s race. Kristal got a decent start, in about 7th place out of the field of 18. The conditions made passing difficult, with few wide sections, so she slowly fought her way through the field until she climbed to 4th place, hunting for the front. The eventual winner had wisely gotten the hole shot and the benefit of having a clean course with no traffic was impossible to overcome. In the end Kristal was able to gain another spot for 3rd and also took 3rd overall in the series. Carl hit out next, starting 4th row. He got a slow start, heading off the pavement back in the mid 20’s. Over the course of the race he was able to consistently improve his lap times and move up, finally finishing 17th on the day, grinning ear to ear at how much fun it was! This was a small race, at Bear Creek Lake State Park again. 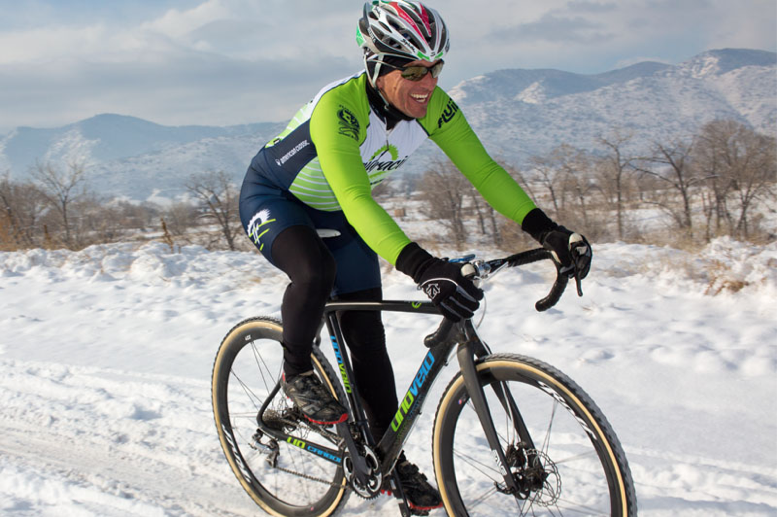 Since the weather was predicted to be similar to the previous day and States are next weekend, plus the fact that it is about 30 miles from Boulder, many riders passed it up. That’s a shame, because it was a lot of fun! The course was snowy, slick, flowy, and had 4 separate times off the bike, including a LONG runup. Carl went first, getting a bit of a slow start up the slick pavement, but making up for it by taking a high line around a backup entering the singletrack, gaining back 5-6 places. He rode really solid, trying to take advantage of the limited passing opportunities, including the unusual sight of him sprinting past guys on the long runup two separate times! In the end, he rolled across the line in 9th place. Kristal went off in the afternoon, by which time it had warmed enough that snow was melting in the direct sun sections. This caused icing up of cleats and pedals, despite liberal application of de-icer and spray lube. Kristal’s field was disappointingly small, but contained Lisa Hudson, fresh off her 2nd place finish in the Vuelta a Cotopaxi mtb stage race. Lisa is a great friend and a fast, tenacious rider so it was great to have her there. She and Kristal immediately separated from the rest of the field at the start and rode a great pitched battle for the entire 45 minutes, with Kristal prevailing for the win at the end. 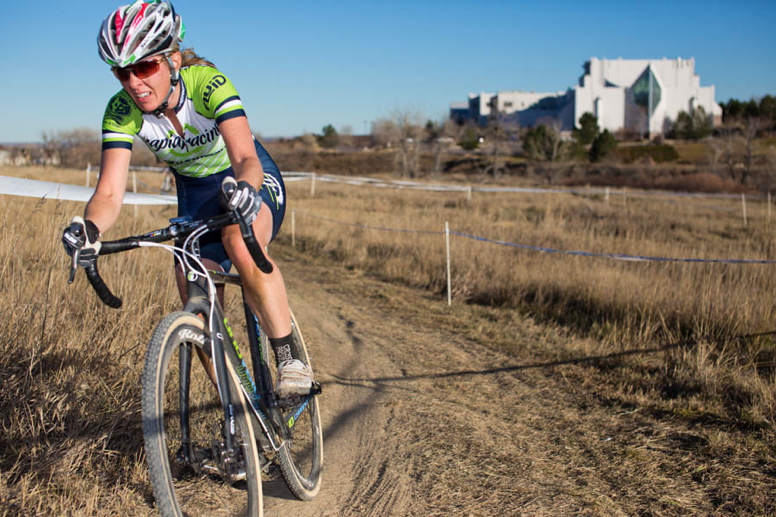 Next weekend is the State Championships, held on one of our favorite courses in Castlerock, with Carl racing 45+ on Saturday and SM3 on Sunday, and Kristal racing the SW Open Sunday. After that, we have a 3 week break before the Altitude Adjustment races that precede Nationals in early January. We’re coming down to the sharp end of the season and our form seems to be on track! December 11, 2013 by Kristal Boni.